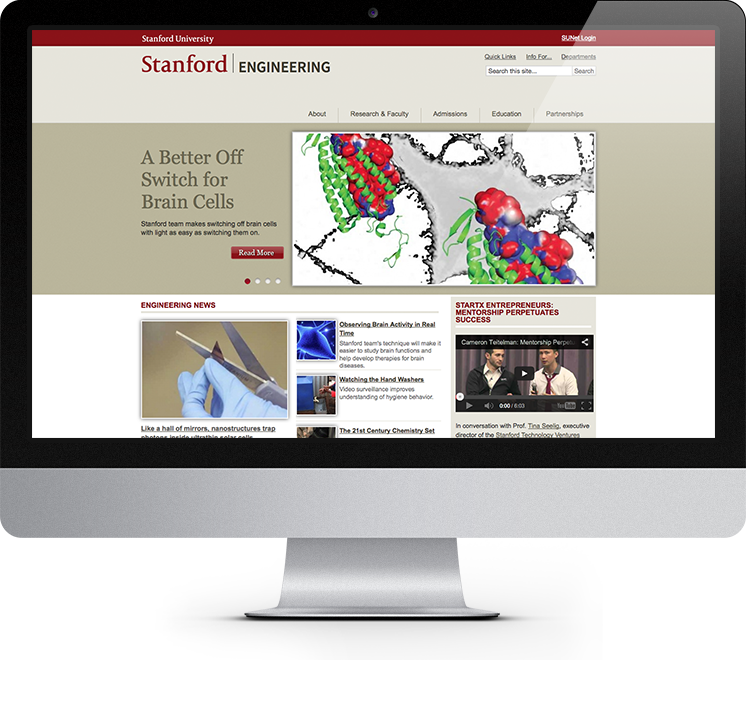 This July, the Stanford School of Engineering (SoE) relaunched their website, finalizing a nine month project with Drupal Connect. The first Phase of the project (completed in January) focused on migrating and combining content from a legacy HTML and custom PHP MS SQL application. The following link provides more details on the Drupal Migration efforts. Stanford needed a lightweight way to share faculty bios, news/press releases, and similar content across sites. Drupal Connect created an XML/RSS Views/Feeds solution that provides simple, one-way sharing from SoE. This will allow department sites, like Mechanical Engineering relaunching August 2012, to enrich their users' visits and stay up-to-date without the extra costs and duplication of manual efforts. The success and need of the content sharing at SoE reconfirmed our decision and inspired us to redouble our efforts to build our next-generation Drupal distribution for universities, Trekk. As part of Stanford's new rich experience strategy, Drupal Connect created an information architecture that makes it easy for students, alumni, and faculty/staff to find the information they are looking for and to discover the amazing work that the university is undertaking every day. The new IA was integral to Stanford's updated Content Strategy and will continue to serve the site as the content and experiences evolve. The new theme is image rich, but the code is light-weight using a base theme built on top of Twitter's Bootstrap. The new theme also incorporates custom design accents from North Studio that truly make the site pop while maintaining Stanford branding guidelines. As part of our efforts to improve page speed delivery, reduce costs, and provide scalability; Drupal Connect installed and configured Varnish. Stanford's unique infrastructure also required SSL for all logins and integration with a custom Apache module, WebAuth--which ties into Stanford's Kerberos system. In order to keep the setup simple, Drupal Connect also installed and configured Nginx as a lightweight SSL endpoint that proxies requests over SSL to Apache and caches static assets for improved performance. In coordination with the new Content Strategy, Drupal Connect installed and configured Apache Solr with several custom search pages. By using Solr, SoE visitors will find more relevant results faster. The use of these new technologies and communication with Stanford's Web Services has established best-practices for Stanford at-large.